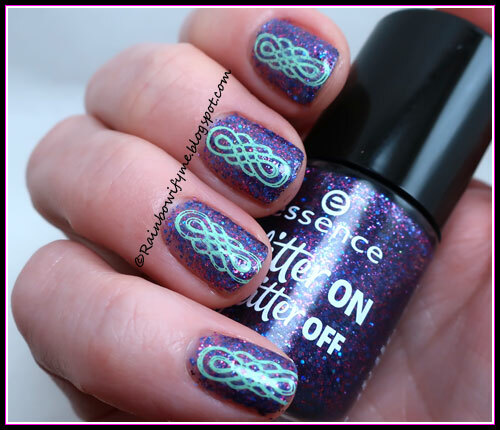 Rainbowify Me ~ Nail blog: Essence ~ Spotlight On! 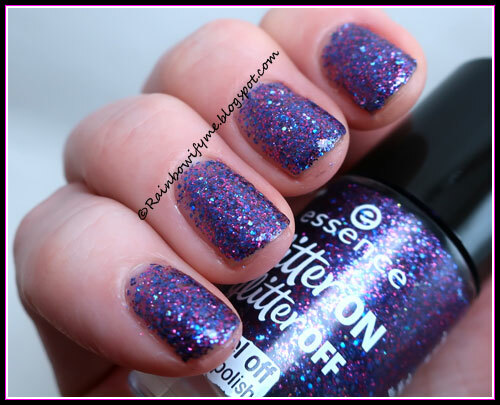 “Spotlight On!” is from Essense’s “Glitter On Glitter Off”-collection. I am not crazy about peel off-polishes because I don’t like the idea of the polishes actually popping off my fingernails whenever it decides to. But a couple of these glitters were so pretty that I decided to give them ago anyway. I wanted to use them for nail art. When I actually got my hands on them, they turned out to be even prettier than expected. That’s why I decided to wear this one on its own and not just for nail art. The formula isn’t that great though. I think it’s a peel-off thing. I used two coats for my manicure but the pictures show that it would have been greater with three coats. The drying time is average. 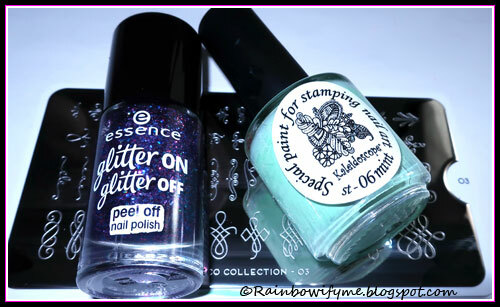 The stamp is from Moyou London’s stamping plate “Deco Collection-03” and I stamped with El Corazón’s stamping polish “Mint”. Here’s the final manicure including a layer of topcoat. This is “Spotlight On!” on its own; two coats and no topcoat yet. These are the things I used today. This glitter is seriously pretty, I love it. But I’ll use it for nail art in future, just like I intended to.